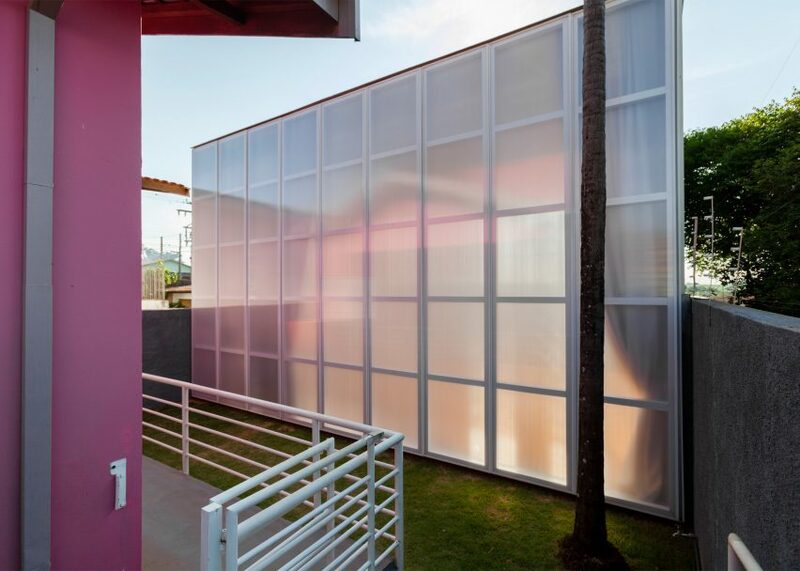 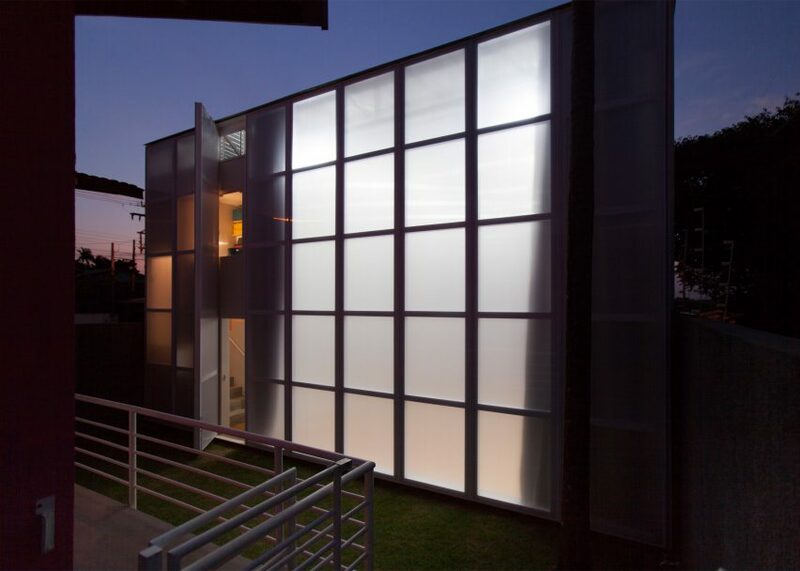 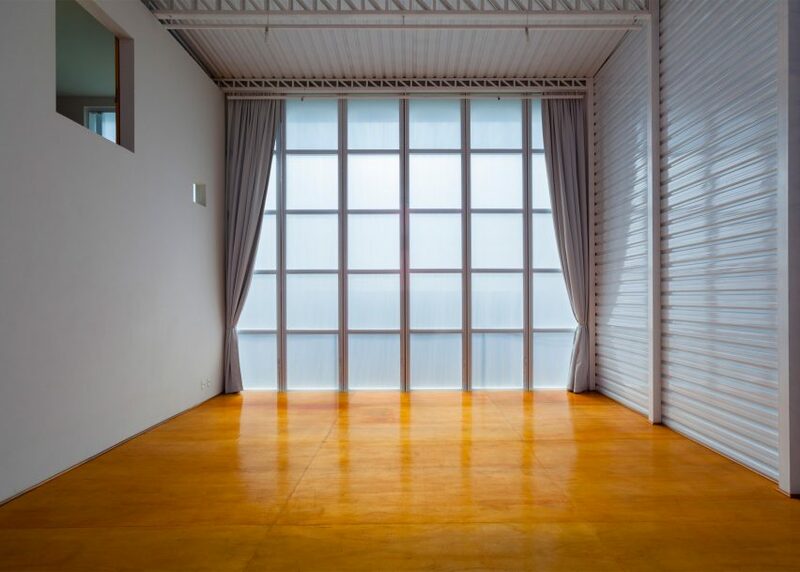 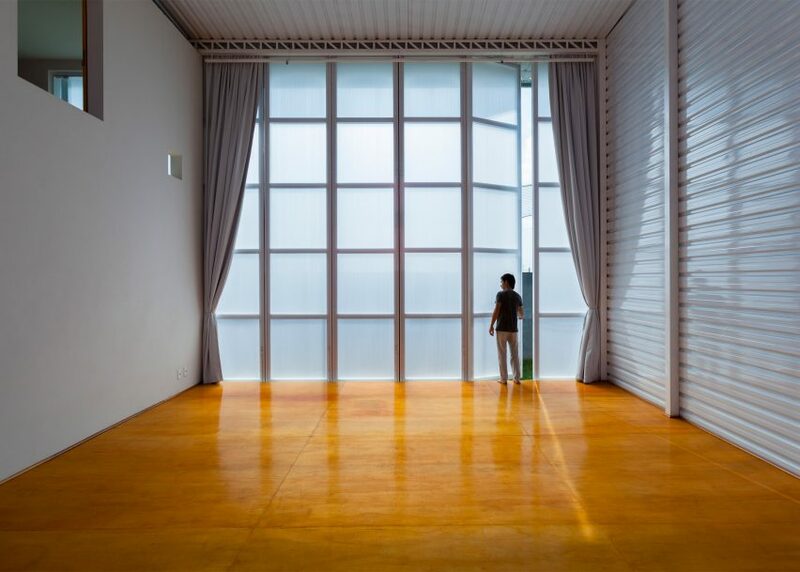 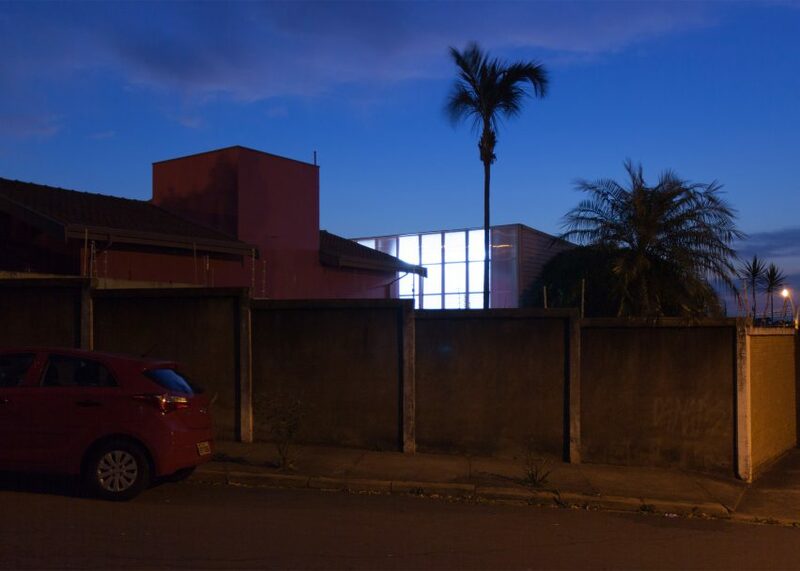 Tall translucent doors open two sides of this theatrical rehearsal space created by Brazilian architect Alan Chu for an actor in São Paulo (+ slideshow). 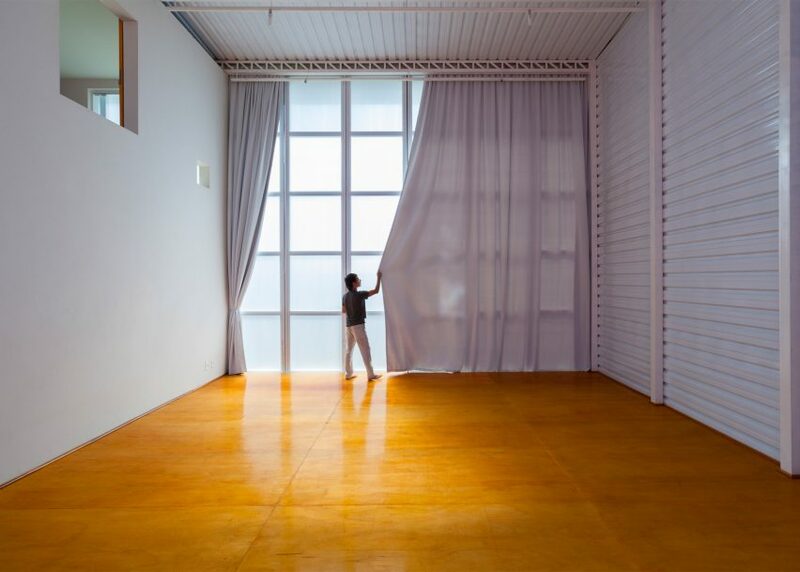 Alan Chu designed the 90-square-metre space to mimic a theatre stage, covering the floor in wooden boards and draping the walls in floor-to-ceiling curtains. Tall hinged doors made from translucent polycarbonate sheets open the front and rear of the boxy structure, allowing them to be used for theatrical entrances and exits. "In addition to serving as closures and providing both illumination and ventilation as needed, these doors also can be opened and closed as part of a theatrical performance," explained Chu. 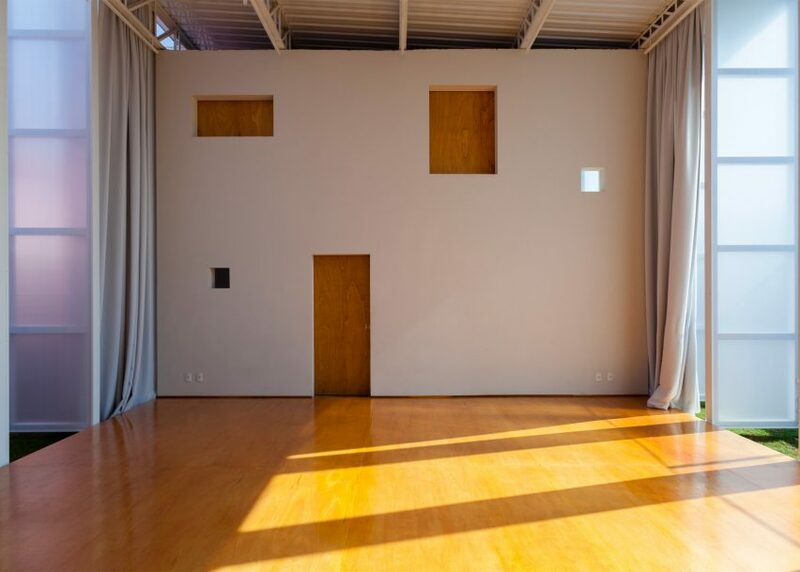 The studio floor and internal doors are made from plywood, but the structure's metal structure is left exposed across the ceilings and end walls. 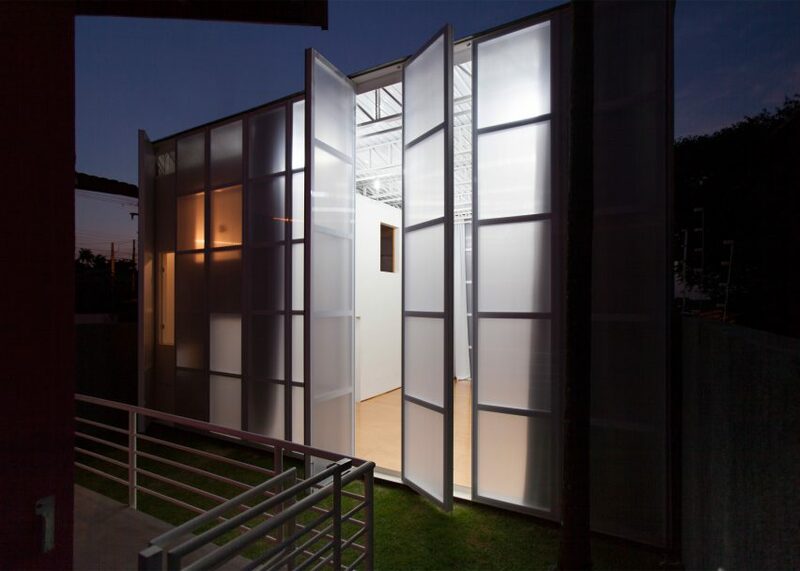 A white masonry box to one side of the main performance space hosts a dressing room and bathroom at ground level, and an office upstairs. 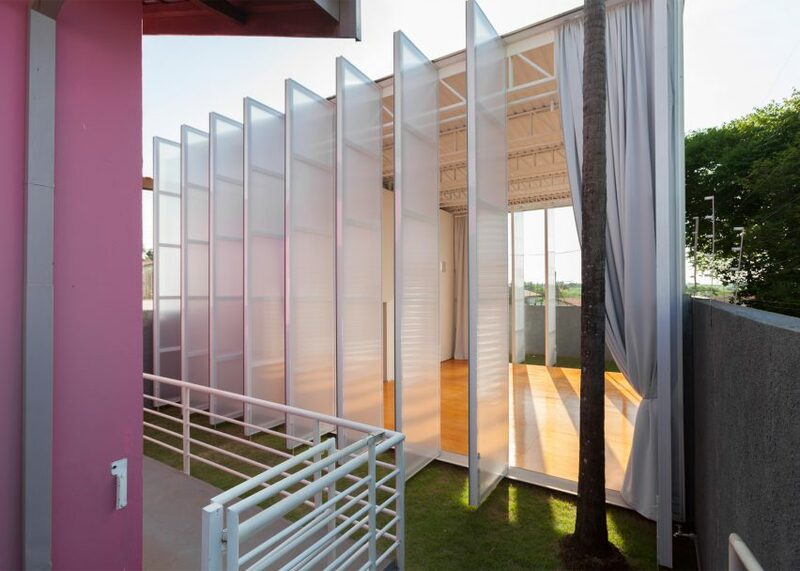 Openings of various sizes are cut into the white wall, but can be closed over with plywood screens. 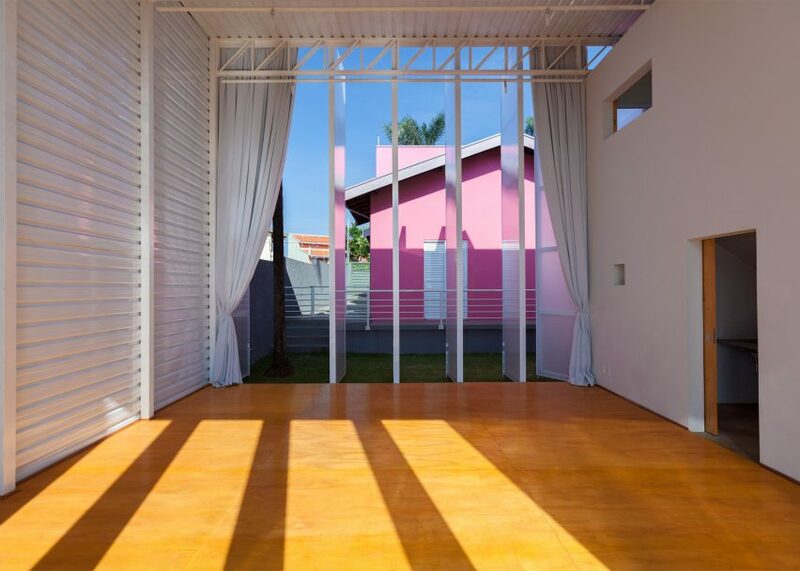 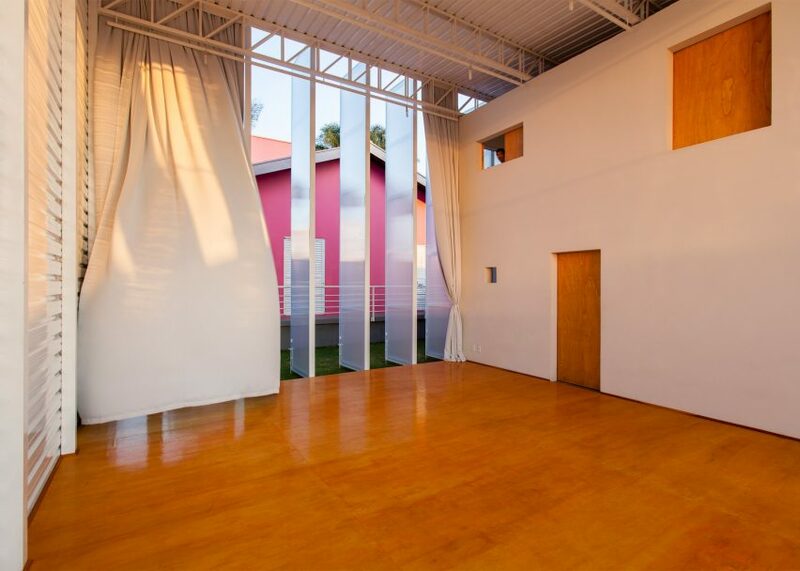 Named Galpão Sim, the studio is built in the rear garden of the actor's house in the Brazilian city. The architect and client hope to collaborate on scenery design projects in the future. 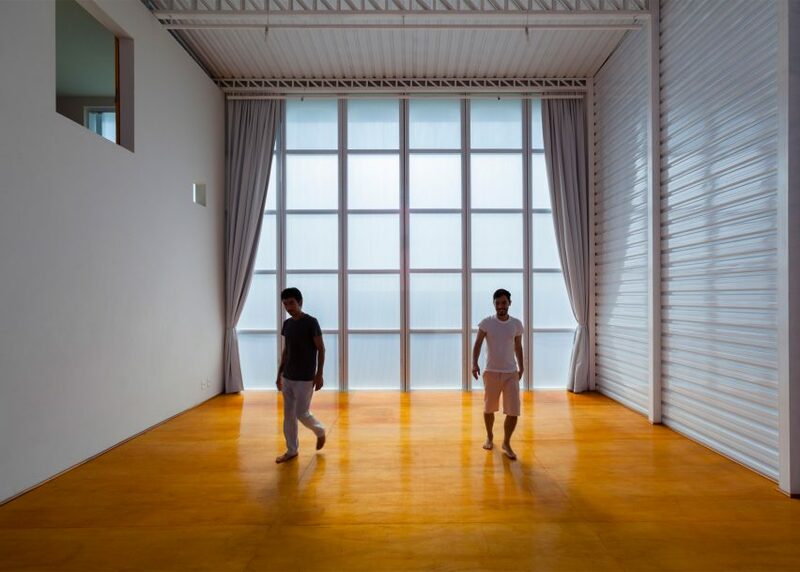 Alan Chu, who also works for Brazilian architect Isay Weinfeld, has previously renovated a São Paulo apartment using ceramic ventilation bricks to create partitions. 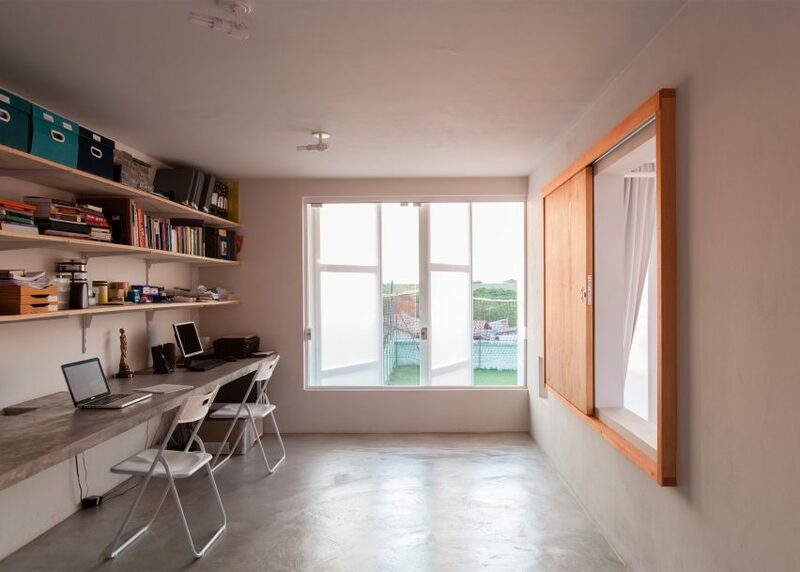 He also overhauled another tiny 36-square-metre in the city to include space-saving storage and a dramatic black, curling staircase. 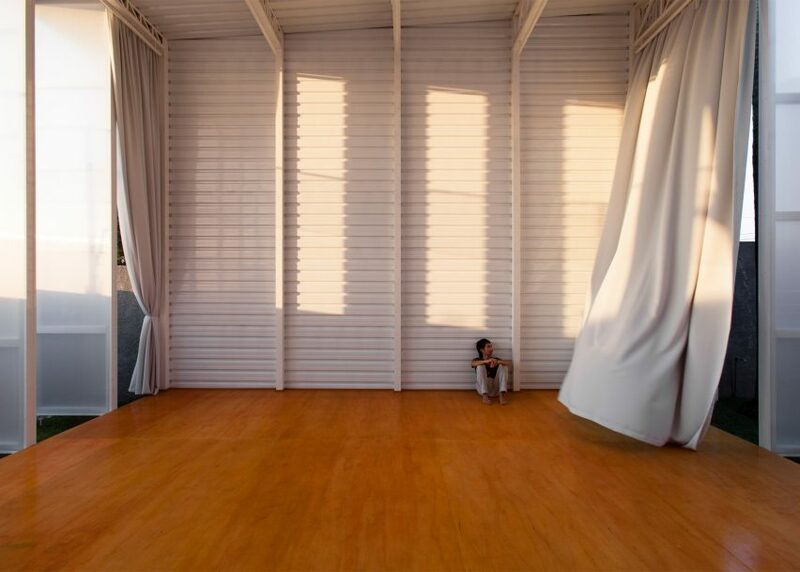 Photography is by Djan Chu.